"She's my sister, my family." “Did you bring your handicap sticker?” Susan asks. “I was too excited. I forgot it,” says Juanita. “Oh wait, here it is!” she exclaims. “Too late, I already parked. We’re walking,” says Susan. Juanita lets out a girlish laugh, not the least bit offended by Susan’s air of gruffness. 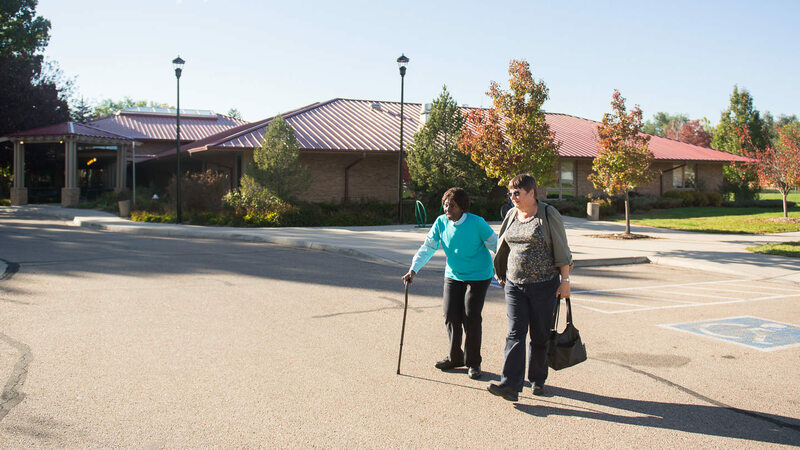 The two have been friends for three years now, since the summer Susan started giving rides to Juanita through Boulder County CareConnect’s Medical Mobility program. Juanita and Susan are not the most likely of friends. They come from different generations, and have very different backgrounds and life experiences. Nevertheless, their friendship comes naturally to them. Juanita originally hails from Michigan. Her parents, who were native Mississippians – which may be the source of her subtle Southern accent – raised Juanita and her seven siblings in Jackson, Michigan. They were devout Christians, and instilled in their children the value of loving all people no matter who they were. She’s not afraid to admit, however, that her family was dysfunctional at times. “Dysfunctional but loving,” is how she puts it. From a young age, Juanita was friends with Louis Preston Thorton Jr., the man she would later marry and with whom she would have two children. They eventually settled in Lansing, Michigan, where Louis worked at General Motors for the next 41 years. She’s joking, and her high-pitched laugh has returned. After many years together, Louis passed away, and Juanita got sick. 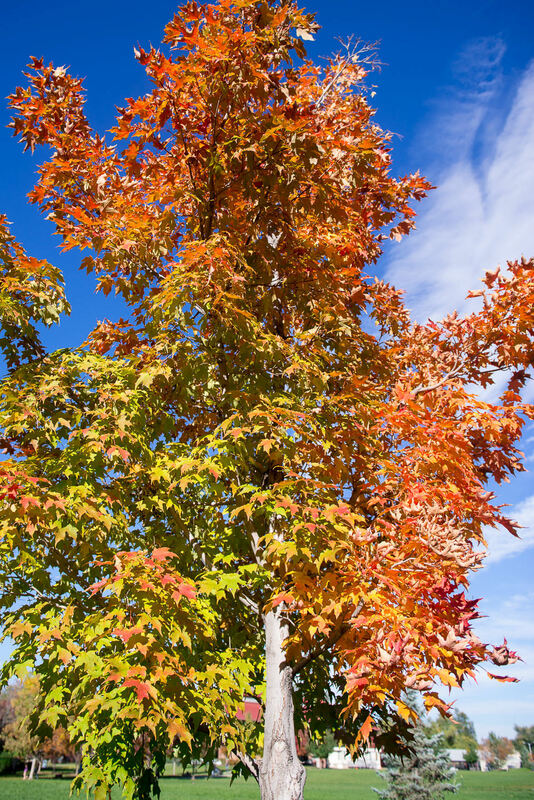 The cold weather in Michigan wasn’t doing her any favors, so she moved to Longmont, Colorado. Susan, like Juanita, knew her family was dysfunctional. She remembers that she couldn’t wait to leave Long Island. So, she went far away, to Colby College in Waterville, Maine. After graduation she moved back home to Long Island, but it wasn’t long until she was packing up again. She and a friend bought a house in New Hampshire, where they lived until Susan’s mom passed away. “Once she passed I said, ‘What the hell are we still doing here?’” Susan remembers. She moved once more, this time to Colorado, a place she had often visited over the previous 20 years. Unfortunately, after her move Susan faced a series of tragedies. Before she was even unpacked she received a call informing her that her brother had been diagnosed with brain cancer. She then lost her job, her father, and her nephew’s wife. It was a difficult time for her as she was trying to start a new life in Colorado. After Susan lost her job, she began looking for volunteer opportunities. She came across Boulder County CareConnect and attended an orientation. “They weren’t going to let you out the door until you signed up for one of the programs,” Susan laughs. 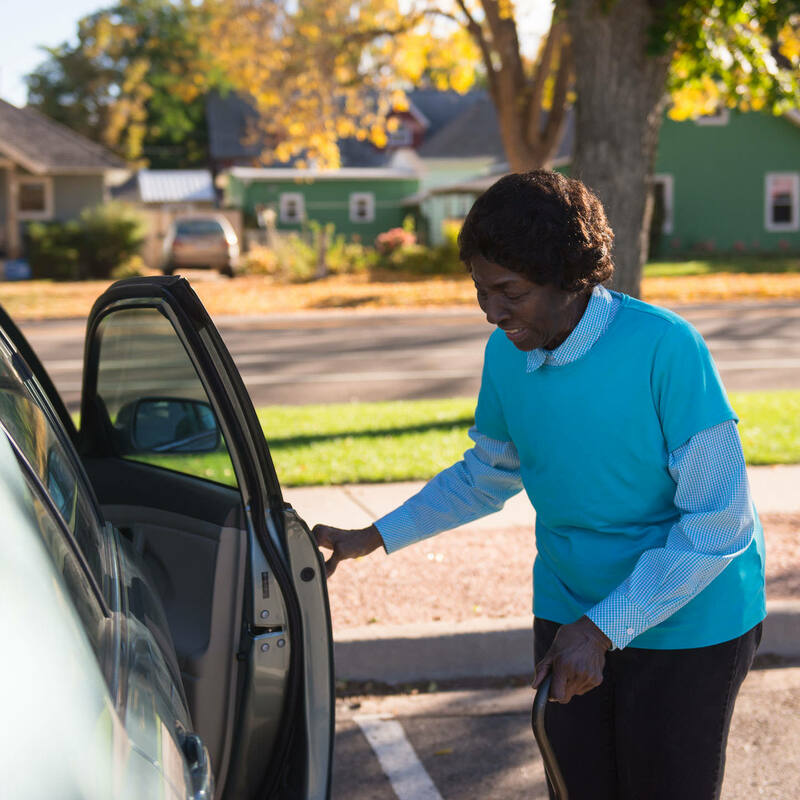 So, she signed up for Medical Mobility, a program connecting members of the community with seniors who need reliable transportation to and from their medical appointments. Juanita had just left Michigan and its cold dreary weather. 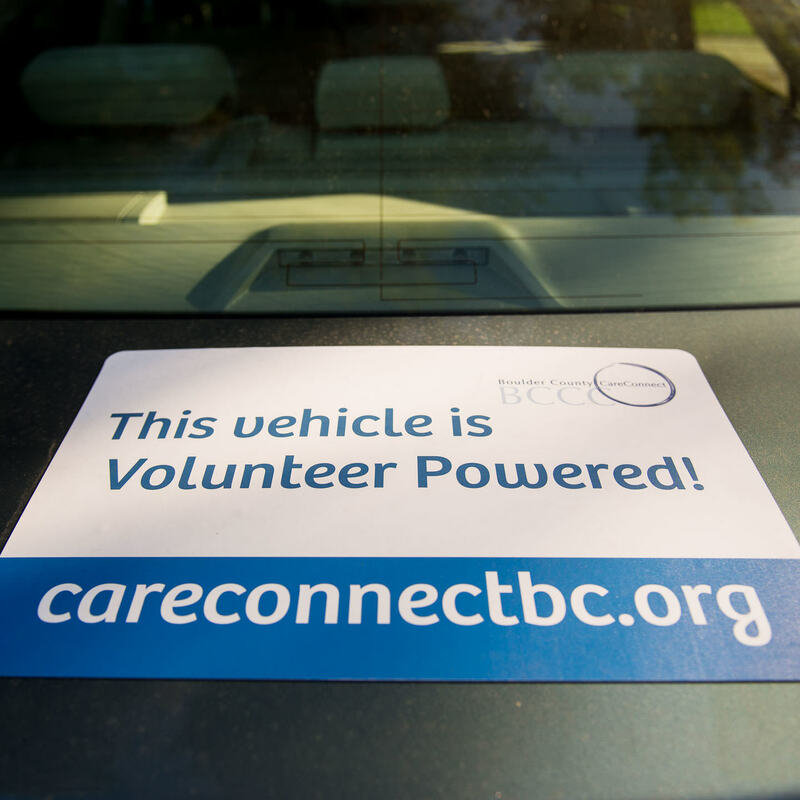 She was sick at the time, and her son suggested she contact Boulder County CareConnect, an organization with services she had never encountered in Michigan. Her first ride happened to be Susan’s second or third. 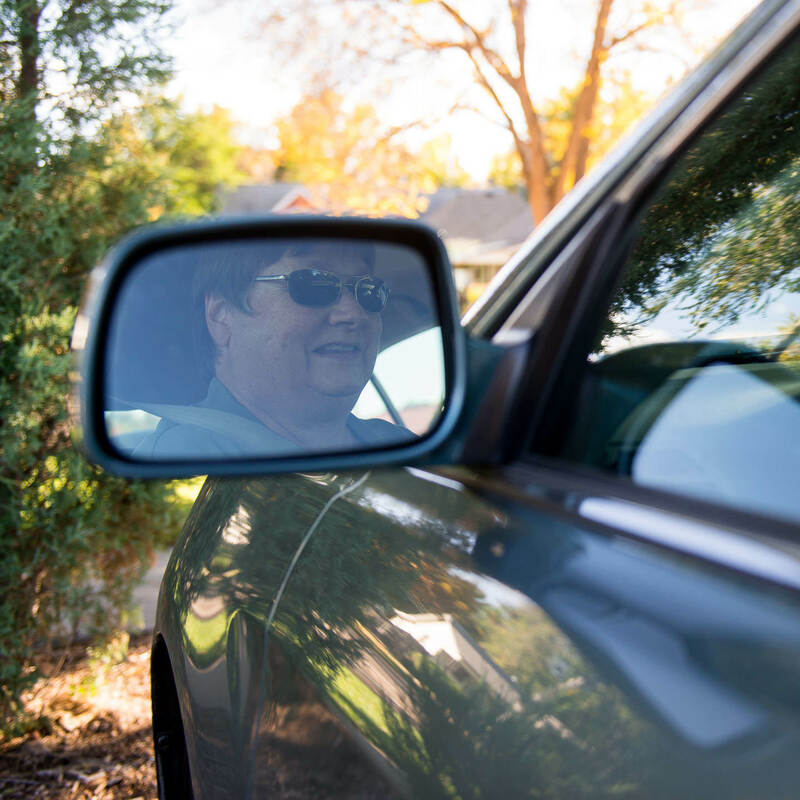 Susan had randomly picked someone who lived in Longmont so she wouldn’t have to drive very far, and that person was Juanita. The pair still remember their first meeting. Juanita was outside waiting for Susan, and was wearing a sweatshirt over her head in order to get some sun on her legs. Susan didn't see her as she walked past, and knocked on the door to her apartment. Juanita's son answered the door and told her his mom was already waiting outside. A little wary, Susan walked up to Juanita. Startled by her approach, Juanita jumped up from under her sweatshirt with a yelp. “She jumped up and I thought to myself, ‘This lady is strange.’” Susan says. The two women may appear different when you first meet them, and as you get to know them you learn about their unique characteristics. A simple example is that Juanita has a sweet tooth, while Susan prefers salty snacks. But like their tastes, their personalities complement each other. Juanita is the conversationalist of the two. She loves to talk, and she has a large, expressive presence—her voice, her gestures, her personality. Susan, on the other hand, is more reserved. She prefers to take a moment to think quietly before speaking. 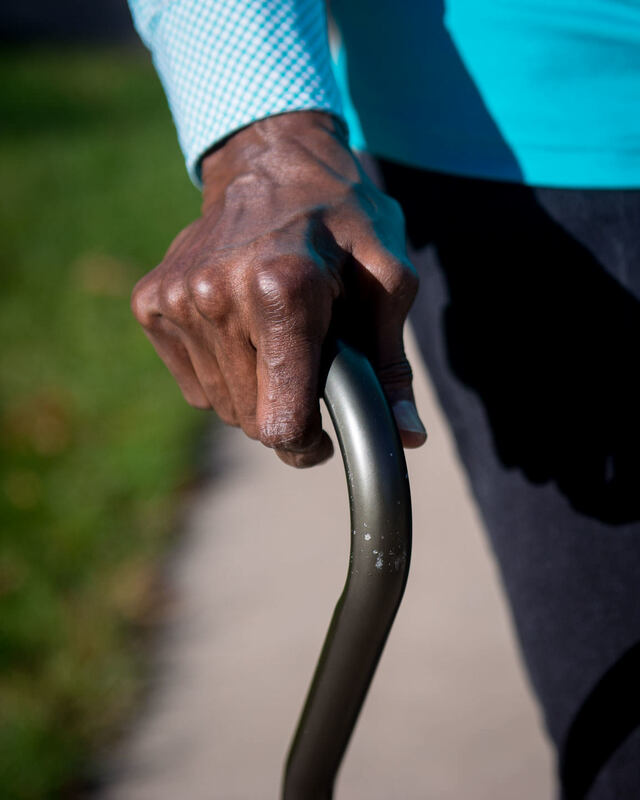 While their friendship did start tentatively—first by agreeing to stop for groceries on their way home from a Medical Mobility appointment—it quickly grew, and they settled naturally into their roles, each bringing their unique characteristics to the relationship. Now, three years later, they meet at least once a month simply to hang out. 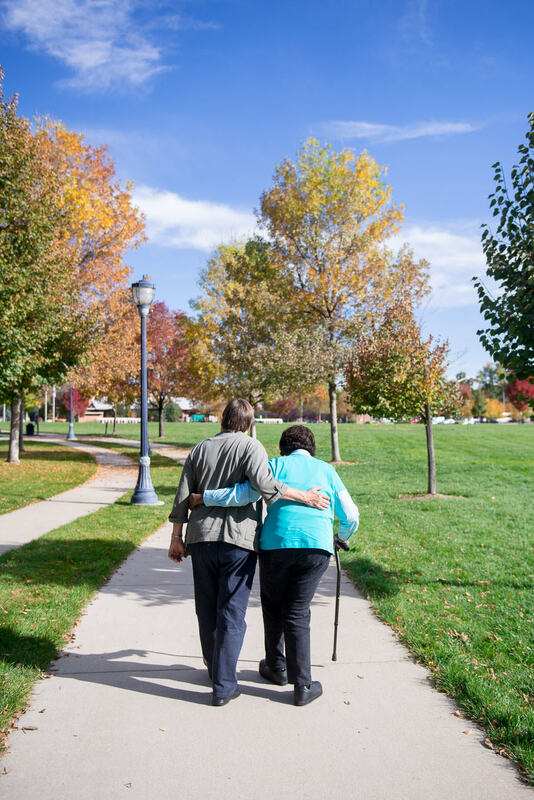 Sometimes they go out to eat, or they run errands, but most of the time they enjoy simply attending classes together at the Longmont Senior Center. And when they can’t meet in person they connect on the phone. You can tell they feel perfectly at ease with each other, from the way they sit close together and touch each other’s arms, to the way that they joke around and finish each other’s thoughts. Most of all, you can see their closeness through the care they demonstrate to each other when facing difficult times. “Susan is not just my friend. She’s my sister, my family. And it was instant with her. It was just so easy. I’m completely relaxed with her,” Juanita says. "Cultivating a friendship with Juanita is like the growth of a flower. Every day it looks different. In the spring you can see just the bud. Then you watch it open a little and you can see the color. Eventually, you see the whole flower." Although they have a number of characteristics that make them different, they do share an important, core value: honesty. It’s the backbone of their friendship, and they never hold back from each other. This commitment to honesty, however, did not keep Juanita from recently keeping a secret from Susan. The secret? She was planning on paying for them to take a trip together. And although Juanita’s secret was unintentionally revealed, her plan demonstrated their growing friendship and fondness for each other. Brought together as a client and volunteer without any shared history, Juanita and Susan’s relationship is a wonderful picture of how two people can care for one another, serve one another, and ultimately cultivate a beautiful friendship. 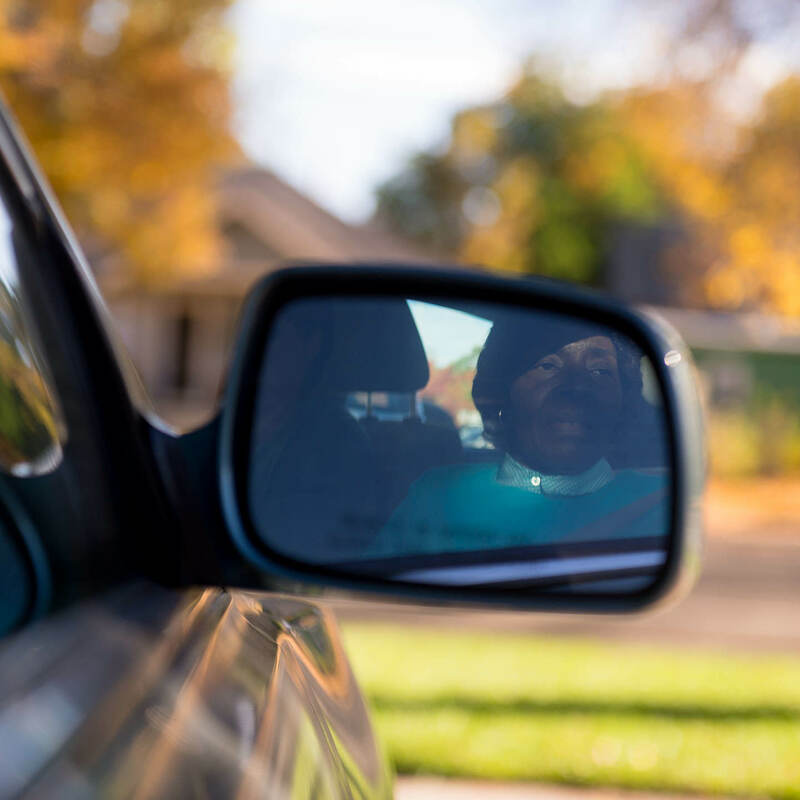 Reflecting on their friendship, Susan looked at Juanita and smiled, “It’s been three years, we’ve been through sickness and health and even death together." 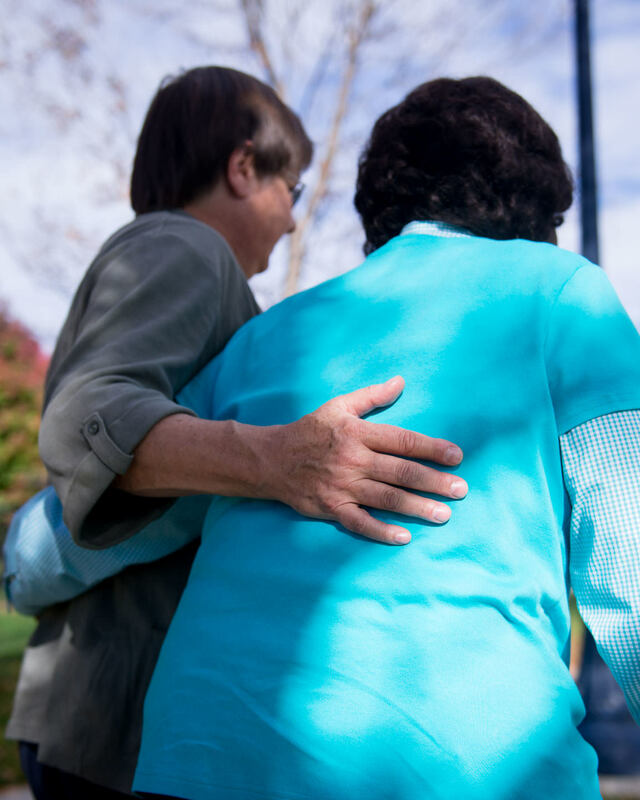 At Boulder County CareConnect we have dedicated ourselves to helping seniors such as Juanita flourish through active engagement—as recipients and contributors—with their community.